Old maps make fascinating reading. Take a look, for example, at the late 18th century Richardson, King and Driver map of the New Forest showing the hamlet of Emery Down, north-west of Lyndhurst. The pattern of main trackways can be seen much as it is today. From the south-east, the road comes up Emery Down Hill from what was the Swan Alehouse, at Swan Green; the route to the west leads towards Bolderwood, and to north-west to Stoney Cross. Pilmore Gate Heath, Lyndhurst Hill and Northerwood Inclosure are all names still in current use. 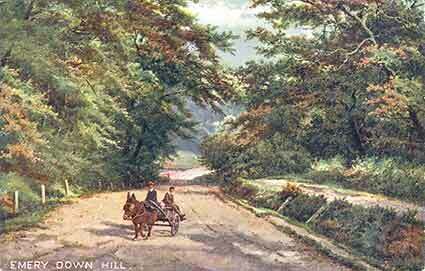 Kitts Hill, though, had lost its name by the time of the 1870s Ordnance Survey map, whilst Gravel Pit Hill had become James’s Hill. Following the contour above Northerwood Inclosure, the course of Silver Street - the name is thought to be a corruption of Silva, meaning ‘the road to the woods’ – is largely obscured by hill-top shading on the Richardson, King and Driver map, but is clearly shown on the later, 1870s map. By repute, Silver Street was once the home of charcoal burners, but by the 1841 Census only one is listed: John Veal, aged 50 years. The Census includes details of the inhabitants of 15 properties in the street - the majority are agricultural labourers, although there is also a gardener, a char-woman, a journeyman tailor and a journeyman carpenter. Perhaps Silver Street’s best-known son, though, was the New Forest snake-catcher, Harry (or more properly, Henry) ‘Brusher’ Mills, who was born there in 1840. In the 1841 Census, parents Thomas and Ann are listed, together with Henry, aged 1 year, and siblings Emma, Fanny, Maria, Ann and Sarah, whilst in 1851, the family were still at Silver Street, and further children, Lucy and George, had been added to the brood. In the first half of the 20th century, A.R. Quinton produced a water-colour painting showing the entrance to Silver Street – see the illustration. Viewed from the small area of grassy heath on the opposite side of the current through road, the scene is readily recognisable, although the thatched roofs at centre left and right are no longer present. Today, Silver Street’s village store advertises general groceries, home made pies and savouries, filled rolls, cold drinks and ice cream. It also serves as the local post office, but, sadly, faces closure during 2008. The 1870s, 1898 and 1909 Ordnance Survey maps, all illustrated, offer considerably more detail than did Richardson, King and Driver. The church, built in the early 1860s, is marked on the 1870s Ordnance Survey map, together with its adjacent graveyard. 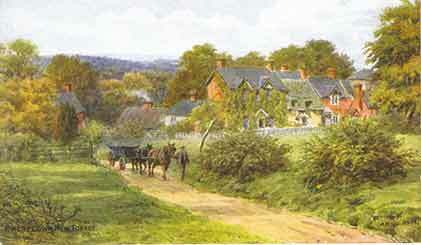 The village school, opened in 1865, is shown, and so is the New Forest Inn, the lodge at the entrance to the Northerwood estate and, of course, Northerwood House. The locations of a number of wells are also marked, whilst boundary stones indicating the extent of the Manor of Minstead are shown as ‘BS’. One such stone, marked with the initials of Henry Combe Compton, a 19th century Lord of the Manor of Minstead, can still be seen beside the Bridleway leading north-east from Silver Street. 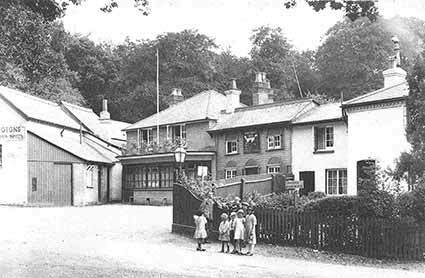 By the time of the 1898 Ordnance Survey map, an ‘old sand pit’ has appeared beside the New Forest Inn, presumably disused even then. Today, whilst still visible as a deep scar cut into the wooded hillside, the leaf-strewn pit has largely returned to nature - deer slots and droppings betray nocturnal visitors, and tangled roots of oak and beech cascade down the banks, leaving behind little evidence of sand. An 1845 New Forest Keeper’s ‘Return of pits’, however, indicated on Lyndhurst Hill, three marl pits, two gravel pits and three sand pits, but these all escaped the mapmaker’s attention. The Vicarage is marked for the first time on the 1909 Ordnance Survey map and, rather belatedly, so are the village almshouses – they were built in 1871. And so the pattern of settlement known today was largely complete by the early 20th century.